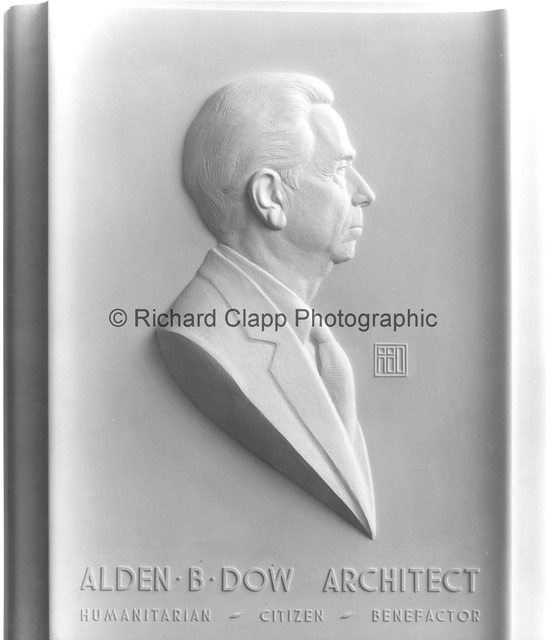 Marshall M. Fredericks Sculpture Museum | Plaster model for "Alden B. Dow Portrait Plaque"
Alden Dow was born in Midland, Michigan in 1904. Early in his life Alden Dow developed an interest in design. Following the custom of the day, Dow attended the University of Michigan to study engineering in preparation to enter his father’s company. But he found his interests lay in a different direction and after three years Dow became a student of architecture at Columbia University, graduating in 1931. After a year and a half association with the offices of architects Frantz and Spence of Saginaw, Michigan, Alden and his wife Vada spent a memorable summer (1933) with Frank Lloyd Wright at Taliesin in Wisconsin. Returning to Midland, Dow opened his self-designed architectural office in1934. Alden Dow's early work was primarily in the residential field. The bronze plaque is located at the Alden B. Dow Museum of Science and Arts, Midland, Michigan, and the Grand Traverse Performing Arts Center, Interlochen Center for the Arts, Interlochen, Michigan. Richard Clapp Photographic, “Plaster model for "Alden B. Dow Portrait Plaque" ,” Marshall M. Fredericks Sculpture Museum, accessed April 22, 2019, http://omeka.svsu.edu/items/show/1291.